In the period from 19th of March until 6th of April, Urban Plastics were part of the exhibition of The 43rd Zagreb Salon of Applied Arts and Design, within the authorial concept of Silva Kalcic, Anti Design/Permanent Alternatives. 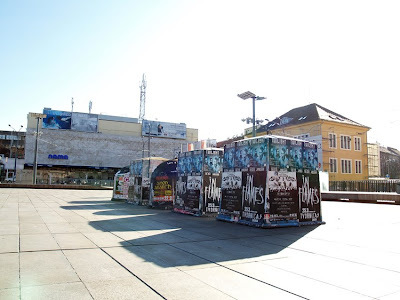 The Plastics were exhibited in the center of the recently rebuilt Kvatric Square, above the underground garage in which the Salon was held. 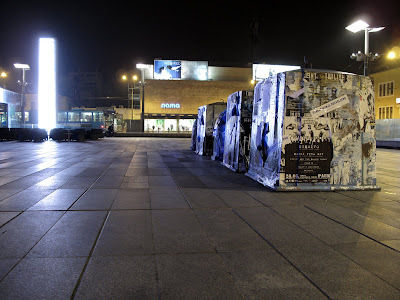 By changing the context from being part of the everyday street tissue to a public sculptural artwork, placed in the middle of the square, the project finished its journey (creating a legal framework, placing the containers to the selected locations, following the changes on their bodies during one year and publishing it on this blog, becoming a part of the Salon exhibition and even winning a prize).